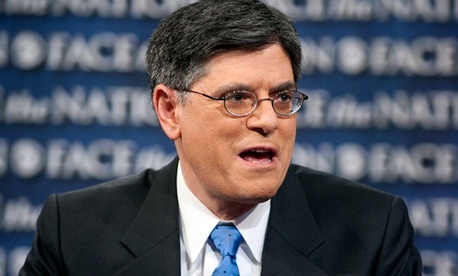 Jacob Lew isn’t the most obvious figure to be charged with securing the Obama legacy. The purposefully low-key White House operative is content to work behind the scenes, and he always takes care to speak strictly on behalf of the president. Yet this Jewish son of middle-class parents from Queens, a stranger to President Obama’s Chicago-centric universe, could help cement the way the first African-American president is remembered if Lew can cut a sweeping budget deal in the coming months. To do that, however, he might have to give ground and trigger what critics may see as the first steps in the dismantling of the modern social-welfare state by allowing Republicans to chip away at the very ideal that has inspired and informed Lew’s public service since the days he learned Washington’s mores at Tip O’Neill’s side. It’s a lot to ask. But that will be Lew’s job as Obama’s chief of staff, a position that could expire in two months and, with it, his leverage. Should Obama win, Lew is seen as a top contender for Treasury secretary, with the biggest mark against him that he is so highly valued in his current post, Obama might prefer to keep him at the White House. Either way, the task of cutting a “grand bargain” doesn’t grow any easier. If Lew can close a lame-duck compact that somehow chops the deficit, avoids the hated sequester, and largely leaves Medicare, Medicaid, and Social Security intact, Obama would be ranked with Presidents Reagan and Clinton, who cut large-scale budget deals that preserved costly entitlements. If he blows it, Lew becomes just another in a long list of aides who couldn’t break the stranglehold of dysfunction that has seized the capital. With the president’s backing, Lew is determined to not let that happen. And he has no interest in repeating the mistakes of the debt-ceiling standoff. This time, there will be no chats on the Truman Balcony or glasses of Merlot for John Boehner, as took place in 2011 when the GOP House speaker and Obama tried to strike a grand bargain on the budget. Instead, the administration plans to play hardball in the six weeks after the election. And the White House is looking not just to House Republicans for the contours of the compromise. Under Lew’s direction, the administration instead will reach out to the Senate and to House Democrats to try to build a consensus before dealing too much with the tea party portion of the Republican Party. By causes, Gregg means Medicare and the rest of the social-safety net. These are the progressive ideals close to Lew’s heart, friends and former colleagues say—and programs he will cut or change only in exchange for an equally big prize: in this case, the Republicans agreeing to more revenue, as Obama has called for from the campaign trail. Read the full story on National Journal.